Installation view of Cordell Taylor’s Process exhibition at The Gallery at the Main. The gallery on the fourth floor of the City Library includes not only a large interior space but also its exterior walls and the mezzanine-like floor space outside. Normally, it rewards two artists sharing the space. The sculptor Cordell Taylor has taken over all of it, as well as part of the lobby near the entry, to display what may be the largest and most splendid assortment of his work ever assembled in one place. 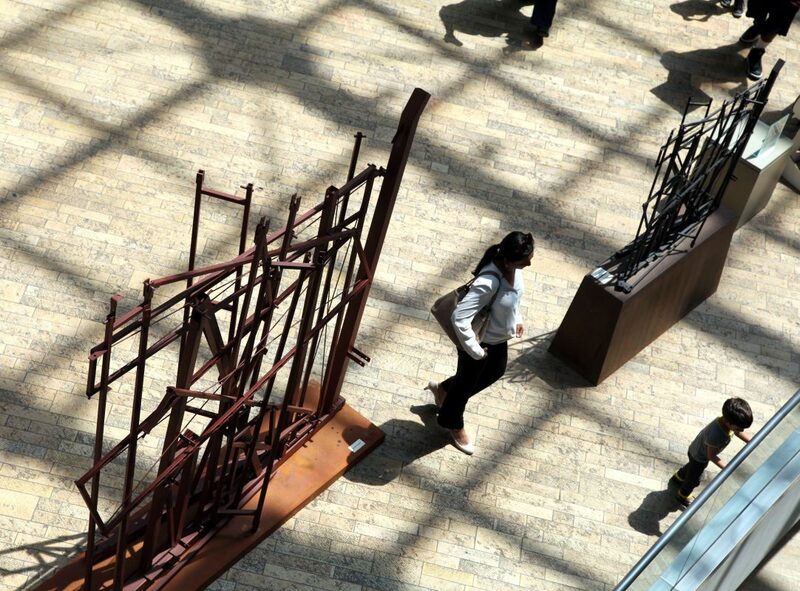 Celebrating 26 years of art making, the exhibition is not to be missed. Taylor’s mature goal is the production of large works that respond to the various characteristics of specific indoor and outdoor locations: works he is commissioned to create and install permanently in the spaces they complement. They’re not readily moved about, and in any event should properly be seen in what a biologist might metaphorically call their “environmental niches.” Thus the enthusiast who wishes to know his work better is challenged to seek them out, and then to compare them in memory. Of course there are photos, but two-dimensional images with fixed perspectives can offer only a ghost of the experience of encountering them in person. If the way Taylor’s monumental sculptures come about bears comparison to the way a living creature evolves in response to its environment, many of the creative steps he employs can be seen displayed around the gallery. Why else call a show Process? Enlarged copies of original sketches hang on the walls. Collections of tiny, preliminary models fill three vitrines. These all have been executed in an identical hardwood, allowing first the artist, and now the public, to compare their formal compositions. A viewer might expect this sequence to end with one of the monumental installations, present perhaps in a photo, along with some process shots, or even actual samples, of the steps whereby this illusionistic genre of abstraction is constructed. But someone who says he wakes up at 6 a.m. just wanting to make art can hardly be expected to stick to what is, for him, old news. He’s made some breakthroughs in what his works can say, and demonstrations of this new vocabulary are what fill the lion’s share of the library’s space. Fully appreciating these additions to the sculptor’s language starts with the knowledge that these are, in fact, representational abstractions. Taylor fabricates the component parts, primarily out of steel, and their mass, their solidity, is as much an illusion as is a two-dimensional rendering of space. That grasped, one is ready to move on to the discovery that many of these works forgo this conventional illusion in favor of what might rather be called optical illusions. Instead of seeming solid, even massive, they prompt the viewer into mentally animating them, or seeing through them as if the human eye were an X-ray machine instead. The oldest magic in art may be the use of a line to make the viewer’s eye see whatever object or dimension the artist wishes. 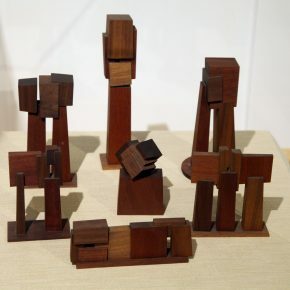 Most of Taylor’s objects, the various cubes and prisms he weaves together, have their origin in the smaller versions he carves directly out of solid wood or stone. Once the constructions that duplicate them on a larger scale are fully formed, they become opaque, and all but indistinguishable from the solid objects they will represent. Yet David Smith, who is widely credited with having invented this approach to sculpture, actually began his career using welding tools to make surrealistic, 3-D drawings. Cordell Taylor has partially reversed Smith’s leap from drawing to sculpting, taking some of his massive objects partway back, into the linear stage that both Smith and he skipped over. The key to this new approach is Taylor’s use of metal tubing, meticulously cut out and knitted together. To grasp the difference, it may help to imagine a Taylor sculpture made of some completely transparent material, such as glass or clear plastic. In such an object, the hollow interior, as well as the truth of how the parts are joined, would all be visible. But his use of tubing, a technique he calls ‘hollow form,’ doesn’t go that far. It allows the viewer’s eye to penetrate the ensemble only from specific angles and directions, while behaving like a conventional sculpture element from all others. In “Geo-Met #182,” a Cubist bouquet consists of seemingly solid cubes the viewer discovers to be open-sided after all, revealing a confounding inner structure that leads the viewer around like a dog chasing its tail, trying to resolve the puzzle-like form. The effect is paradoxical: the goal elusive yet charming. I was reminded of the similarly bouquet-like arrangements of square paper tubes his partner Lenka Konopasek included in Darker Territory, her recent show at Finch Lane. Animation gives way to real magic, though, when both ends of the tubing are open, allowing it to disappear but for a faint, linear presence, when viewed straight through. In “Geo-Mets #171” and “#183,” the elements thus essentially dematerialized become like visible magnetic forces, or aerial diagrams that connect the solid forms. In “#190,” some views become like drawings superimposed on the distant background. Clearly, the brain makes some logical assumptions about what must be present, based on what can be seen, and when these facts and assumptions conflict, the resulting perception is destabilized, resulting in fluctuating conclusions in some cases and transparency in others. 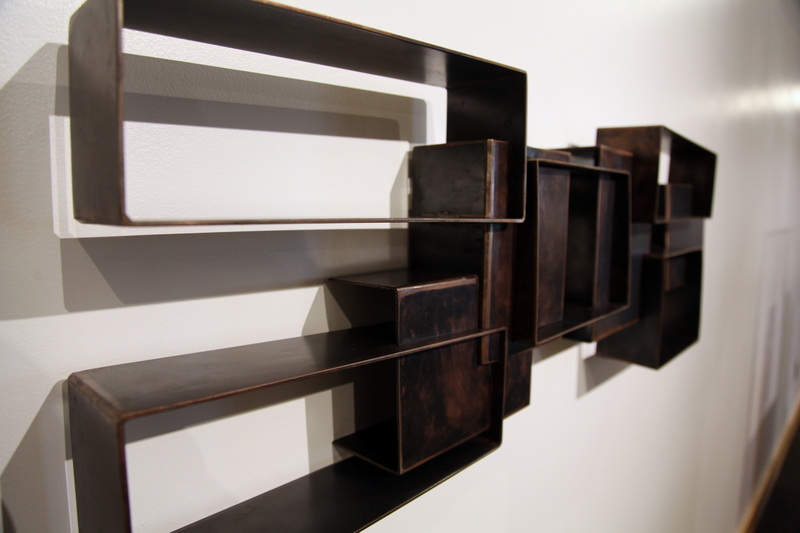 The welding together of raw steel was one of the most substantial innovations of art in the 20th century. Another was the reassembly of discarded materials into new art. 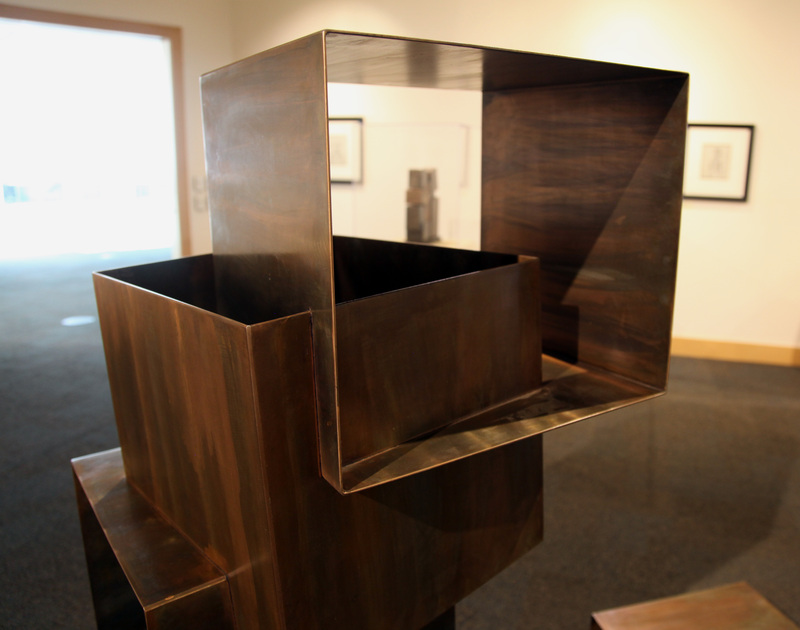 If Taylor’s sculpture primarily partakes of the first, four pieces in Process involve the second. 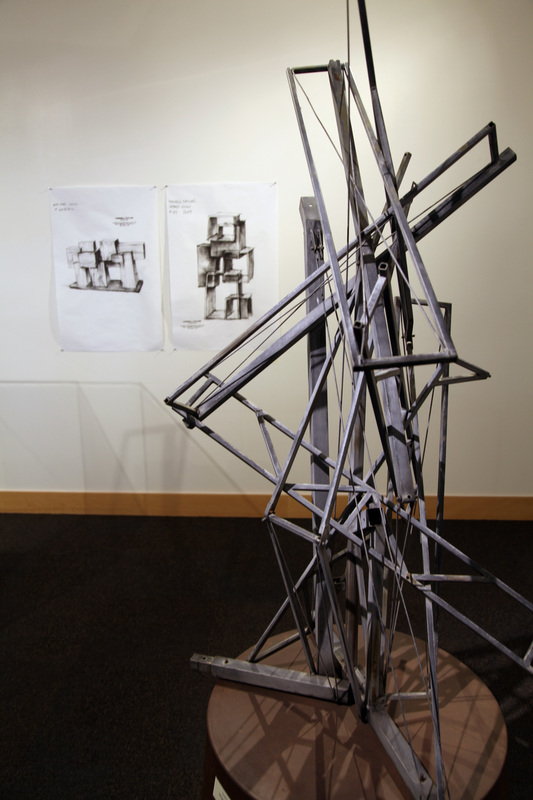 Standing in the library’s lobby, “Mouse Trap” and “Order of Chaos,” both from the Deconstructive Series, are composed of what appear to be salvaged industrial discards. It’s not clear if they were meant to remain this way: labeled 1/4 scale models, their use of reclaimed materials may have been for convenience while working out their designs. Some explanation of their final fate would be helpful. Meanwhile, their titles suggest a specific purpose for one and a vague, philosophical meaning for the other. They differ in heights and colors, but close examination reveals them to be structural twins. Each is a kind of visual screen, not unlike Marcel Duchamp’s famous glass paintings, which incorporate the background and passing pedestrians into themselves. At this point, the prescient observer would do well to take the stairs, instead of the elevator, to reach the show on the fourth floor. The ascent allows looking down at these two, seeing how they stand midway in scale between the viewer and the building, capable of changing character entirely as they shrink in size and stature, becoming one of hundreds of details in an architectural interior that, if anything, looms larger the higher one goes. At the top, “The Fall,” the third of these models, stands close to the wall, inviting one to walk part way around, but not to look through its upwardly thrusting array. Like “The Fall,” “Turmoil,” the fourth of these assemblages, wants to be looked at, rather than through—though its interlocking diagonals are clearly related to similar passages on the two down in the lobby. The most successful of the four, “Turmoil” suggests by turns a derrick, a flying dinosaur, and a long-necked bird: perhaps a swan. The 20th century may go down in history as the last great eruption of masculine preening. 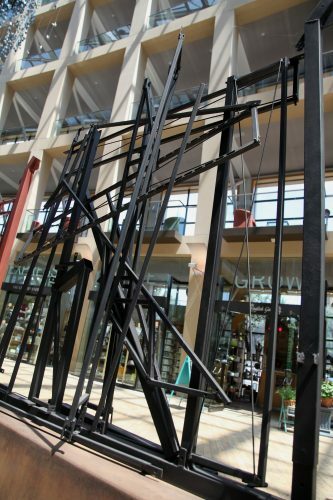 The welded-steel sculpture that preceded Taylor’s was certainly a case in point. Like the Abstract Expressionist paintings that were its first cousin, it reveled in such examples of unrepentant male aura as unfinished surfaces, sharp edges, and viewer-intimidating scale. Taylor achieves something quite different: an overall graceful feeling, complemented by smooth finishes and carefully controlled uses of color. These may be physical objects, but he means them to be welcomed into the viewer’s mind. Although the largest works aren’t present in the library, one appears on the show’s poster. 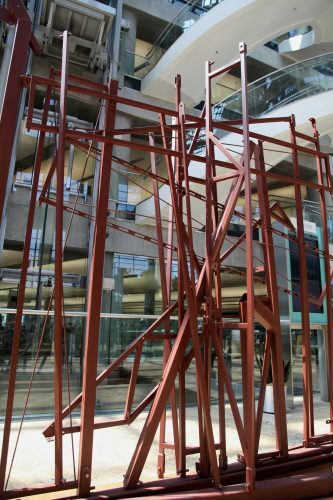 “Balance of Nature,” which was commissioned by Energy Solutions, is shown during its installation, while the scaffolding and tackle used to hoist its parts into place were still in use. That, plus a tool bag, belt, and accessories in the foreground, make clear that just this final step, assembling the sculpture, is itself a daunting process. Furthermore, these peripherals create a sense of scale, an impression in the viewer’s mind of the overall work being about the size of a person. 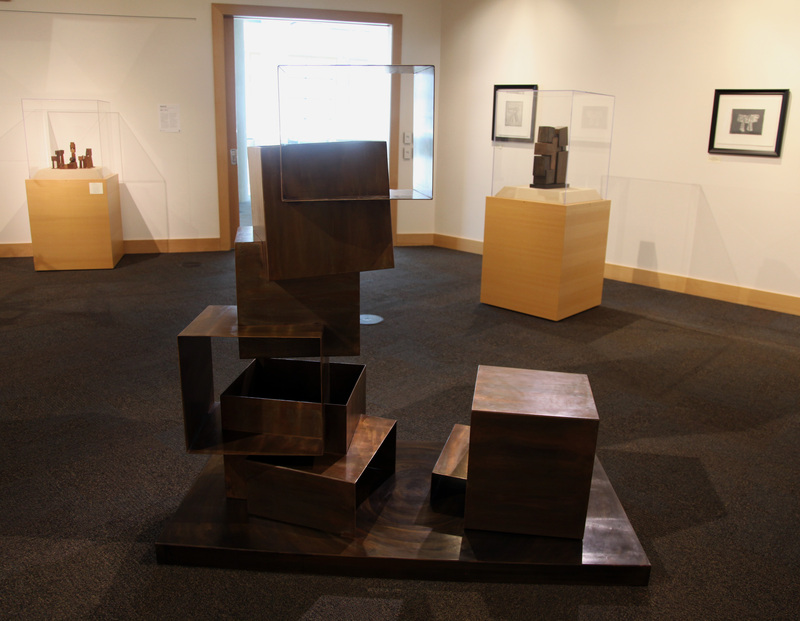 Yet closer examination reveals a stepladder nestled alongside the sculpture’s box-like forms, and only then does its actual size, which is twice the height of an average man, become apparent. 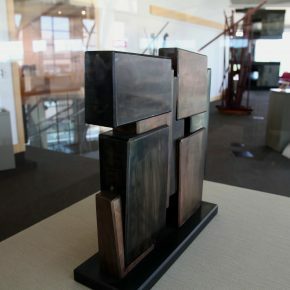 This fact about Taylor’s sculpture, that if shown without cues to its dimensions— something that can easily happen in a photograph—a desktop-size Taylor work cannot be distinguished from its monumental cousin, reminds even the most sophisticated viewer of an often forgotten fact about all visual art. Does a given work fit in the palm of one’s hand, or does it fill half a room? The only way to be sure is to see it in person. This matters because in the age of virtual reality, when a video image of the Grand Canyon can be held in the same hand that holds one of his models, an artist like Taylor wants the ultimate encounter with his aesthetic constructs to be as physical as possible: as physical as coming up against a wall. Showing models effectively admits his audience into his studio practice, and the desktop pieces are like flying over Stonehenge in a helicopter, taking in the grand scheme. But these experiences are visual spectacles, not an encounter. 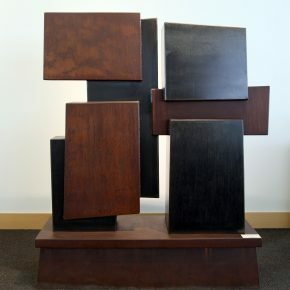 What really matters—how the parts join together, in the presence of gravity, to make up a coherent, unified ensemble—can only be felt through a collaboration between the eyes and the body that carries them, as it moves around the substantial body of the sculpture, exploring all its perspectives. That his structures are fundamentally sound, harmonious, and dynamically balanced may make them seem less expressive of the complexity of human experience than the works of some other Modern sculptors. But Taylor makes his point less with what they are, and more with the alternatives they recommend. The aesthetic pleasures of their sense of balance, visually pleasant surfaces and colors, and their feeling of stability invite not only a close approach, but also frequent return. Like gates that require no doors, they invite companionship, their aim being the opportunity and desire to contemplate how they fit together, jointed like so many individuals who must cooperate in order to successfully share what, in the present day, has suddenly become finite space. Living in a world that increasingly feels like a giant factory that produces isolation, where every problem seems to trace back to the collapse of community, a species that learns best by example can take pleasure, and perhaps even learn from, these graceful examples of interaction and mutual support. Process: Cordell Taylor Sculptures 1992 – 2018, Gallery at Library Square, Salt Lake City, through Aug. 10.